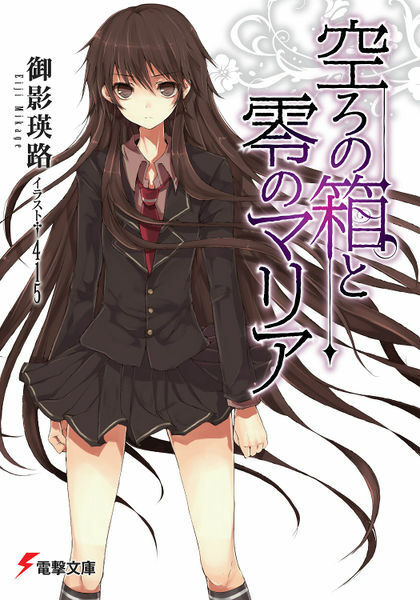 Utsuro no Hako to Zero no Maria, or The Empty Box and The Zeroth Maria, tells the sinister story of Kazuki Hoshino, who is almost madly attached to his everyday life, and his antagonist Aya Otonashi, who suddenly transfers into his class—for the 13,118th time. She majestically announces to “break” him, without paying heed to anyone else around them. This is but the start of a dark roller coaster ride that turns the two against themselves, the people around them and the one who may be god. Read on as their relationship slowly changes as they go against their most basic values in their struggle against the world itself. If you could wish for everything, what would you wished for? On the fist volume, days that kept repeating. ... more>> The second volume is about another taking another's body. Third and Fourth volume = battle royale. Yeah. One of the best. No argument there. Its a horror story with great plot, almost no cliches and very good plot twists, whats there to not like? Utsuro no hako is an occult story where our innocent protagonist finds himself stuck in a series of loops. The plot is very well made. The characters are very well proportioned. And the back stories of the side characters are pretty well laid. The story is written in a... more>> journal-like description in the first volume. So, sometimes it goes to the 1st loop then time skip then goes 22nd loop. Probably the best completely translated light novel you can find. Read it. I can't recommend it enough. I found the first arc and parts of the last arc to be quite exciting, but the middle portions to be extremely cheesy. In particular, the MC (and some other characters) are textbook cases of Chuunibyou, first falling dramatically into despair (... repeatedly. It gets Real old), then making grand speeches about his own ideals, and somehow triumphing magnificently at the end by crushing the opponent one way or another (usually in a not-too-convincing manner, sadly). All this time, there's this creepy guy in the background that's absolutely obsessed over the... more>> MC, even when he's being a whiny kid. There's also this face-palming moment where the MC thinks how much better he'd have handled things instead of a another character, except he spent most of said event moping in self-pity. Maria? A bland robot who needs some sense slapped into her. Characters: 4/5 for the first arc, 2/5 for the rest because of regression and chuunibyou. Mystery: 2/5. The mysteries in the series aren't particularly good. Half of the time the culprit is quite easy to guess, and even when you don't guess it, the answer doesn't feel particularly clever and is within guessable ranges. Concept: 4/5. In the first arc in particular, the way the time loop is used is quite impressive, and the ensuing arcs at least gain points for originality and complexity of setup. The story and plot are interesting, but I've never hated a main character more then I did while reading this. I'm not saying the main character is poorly written or that the book series is bad. Just that every chapter I read I wished the main character would be killed off. My rating of the story is based off my own enjoyment of the series. Not of the series itself. My favourite LN so far. The description may not seem that appealing but trust me and just read it. There are 5 different arcs and every ones of them link perfectly to each other. You might be wondering some questions but as the story progress, the questions are revealed one by one. Characters are unique and not your common LN troupes. Their backstory is well proportioned and they developed through the series and doesn't get "forgotten" by the author. We got to know more about Daiya past. Then, we learn more about Aya Otonashi and "O". The conclusion is well made and leave us with an happy ever after kind of ending. First off Hats off to u author Eiji Mikage-sensei. I really did have a whole lot of fun reading this whole series. It was dark, it was thrilling, it was enlightening, it was really a piece which was an epiphany to me. The story moves forward in a way that ties up all the loose ends in a very satisfactory manner save for one or 2 points which aren't really points to be considered on a whole truly speaking. Humans truly are a mass of emotions as is depicted perfectly... more>> in this novel. Fueled by our egos we even deny that common sense of ours and justify our selfish/inhumane acts by spouting petty words such as justice, welfare, for the sake of the world etc etc. A story about wishes, desires, and boxes. A "Box", an strange system that grants wishes, has appeared in possession of a certain person. Our protagonist Kazuki Hoshino meets a mysterious girl named Aya Otonashi, who asks him to help her find the person who activated the "Box". In a cyclic world where everyday is the same day, this pair must find the one in charge and take them down. Volume one: Day repeats again and again. The story goes back and forth, telling things that happened before the story started in order... more>> to explain what is going on (not that it helps). Confusing. Volume two: Body stealing... Very confusing if you focus on the details or the culprit's motive. Volume three/four: The protagonists get caught in a deadly battle royale arcade video game. A simple story arc with a ominous ending. Volume five: People start behaving like dogs because of some unknown phenomena. Megalomania at its finest. Revolution. Volume six: The megalomaniac gets trapped in a cinema. Someone gets stabbed in order to stop the revolution. Novel's Title finally makes sense. I'm basing this review on the first volume. My opinion might change as I progressed more into the novel. It's not everyday that you'd find a webnovel that keeps you constantly on your toes with suspense, thrills, and mystery. I have to admit, the ending of v1 seems to... more>> be a bit rushed. And so far, if you're looking for a "strong, op, and mature" type of MC, this novel might not be the one for you.